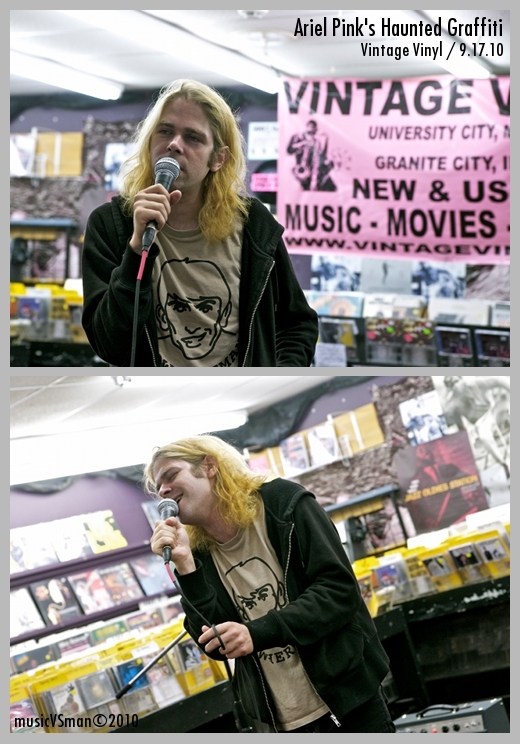 I wanted to wait a few days after the Ariel Pink’s Haunted Graffiti in-store performance at Vintage Vinyl, just to see if taking a step back and would change my opinion about the experience at all. It didn’t. I still thought it was a complete waste of time. Pink showed up alone and partially confused as to what to do. His solution was to engage in a less than 10-minute session of “singing” by himself without any backing music. The quotes are deserved as it sounded intentionally obnoxious, almost as if he hoped he could garner enough disapproval to just end the performance. In-between songs, things just felt awkward as Pink chatted up his fake heckler in the audience. Then, he just decided he was finished and just walked off into the aisles. Some people found it funny. For me, having just spent nearly an hour in traffic to get there, I left really angry. Publicity stunt? Most likely. And it did work by getting a few articles posted on the event (including this one) and a bunch of tweets. But my feeling is that the stunt also did an equal amount of PR harm. In-stores performances should be great ways to attract new listeners or give a treat to those who can’t go to the show (very likely in the case of the sold-out Flaming Lips show), but I have a hard time seeing how either of those goals was achieved. Especially in my case, I haven’t listened to any of Ariel Pink’s albums or music and it even sounds like I’d normally check out. But now? I have no desire to check out his music.